Instrumentation: Cello with two bows. 10 Oct 2018: at Invisibility (Holywell Music Room (Oxford, UK)). Featuring Coral Lancaster. 5 Sep 2014: at Bendigo International Festival of Exploratory Music (Various venues in Bendigo, Victoria). Featuring Judith Hamann. 24 Oct 2011: at Elision Berlin Program (Villa Elisabeth, Berlin). Featuring Séverine Ballon. 26 Sep 2011: at Atticus (Northcote Uniting Church). Featuring Judith Hamann. 15 Jul 2011: at Elision Ensemble (St Andrew Holborn). Featuring Elision Ensemble. 18 Mar 11: Yong Siew Toh Conservatory of Music , Singapore. 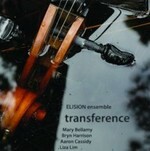 Featuring Elision Ensemble, Séverine Ballon. 18 Mar 2011: at Elision on the Edge (Yong Siew Toh Conservatory of Music). 8 Feb 2010: at ELISION: Invisibility (Hall 2, Kings Place). 26 Nov 2009: at ELISION (St Paul's Hall (Huddersfield)). Featuring Manuel Nawri, Elision Ensemble.